in an earlier post i mentioned that for my visual art, i'm trying to get away from purely abstract work toward a style that's more representational, so i can hone my illustration skills. this applies somewhat to databending (i'll still do pure databending, especially when i discover new bending methods), but especially to collage work. this is a piece called photoshop city that i made several weeks back—the first in a series of representational collages. 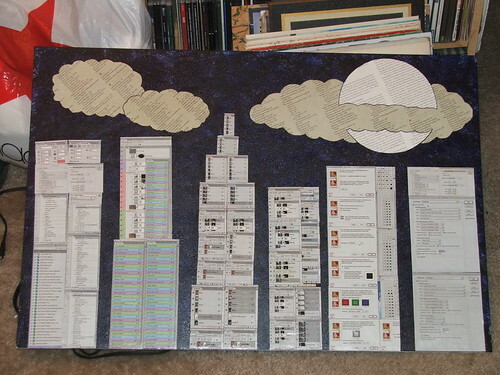 if you can't tell from the photo, the skyscrapers are made of dialog boxes from photoshop 6. the background is acrylic paint. at 30"x20" it's too big to scan, so i'll have to settle for photos like this. this piece and much more will be on display (and for sale) at my first-ever solo gallery show, coming this april to 111 arts gallery and tattoo studio in downtown muncie. i'm hoping to sell a few pieces at that show... if only because we're running out of wall space in our apartment for all my art. um seriously you are having YOUR OWN SHOW??? and when were you going to share? yeah, it's in muncie, at a gallery/tattoo studio run by nate harmon (aka bobby vomit).